Farrar, Straus and Giroux (BYR), 9780374303730, 40pp. 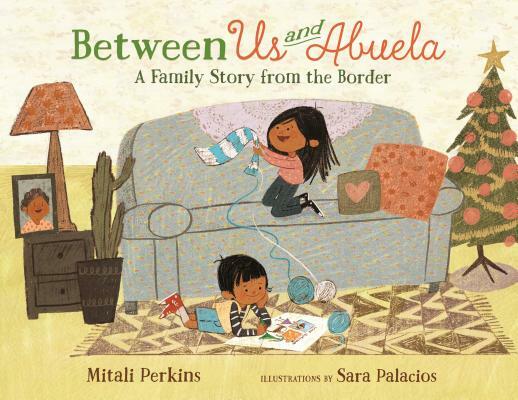 From award-winning author Mitali Perkins and illustrator Sara Palacios comes Between Us and Abuela, a timely debut picture book about love overcoming the border fences between Mexico and the United States. For the few minutes they can share together along the fence, Maria and her brother plan to exchange stories and Christmas gifts with the grandmother they haven't seen in years. But when Juan's gift is too big to fit through the slats in the fence, Maria has a brilliant idea. She makes it into a kite that soars over the top of the iron bars. Here is a heartwarming tale of multi-cultural families, and the miracle of love. Sara Palacios was the recipient of the 2012 Pura Belpré Illustrator Honor Award for her work on Marisol McDonald Doesn’t Match. A native of Mexico, Sara graduated from the National Institute of Fine Arts in Mexico City and went on to earn BFA and MFA degrees in illustration from the Academy of Art University in San Francisco. She illustrates for companies in both the United States and Mexico.